From time to time I check to see if any of my images are being (mis)used by companies that think that Google images is a handy image repository to enrich their own commercial website. Actually the fact an image turns up on a search means that Google has a reference to either the original website or image library and more importantly is owned by someone. A lot of companies turn a blind eye to this and copy the image off without giving a second thought. In almost every case the image will be owned by either the original photographer or an image library. There are many cases of Getty or similar tracking down misuse and slapping the offending company with a massive bill. Most of my images are very client specific, so they don’t readily find their way into mainstream usage. The companies are also protected by license, so images under that license won’t appear in image libraries, so they have piece of mind that their images won’t be used by a competitor brand. If you’ve never tried searching or tracking your images here’s a quick 101. There’s a couple of good resources for this type of information gathering. Google images (https://images.google.com) or TinEye (www.tineye.com), both of these use a reverse image search. They examine the URL of the image provided or you can upload your image for it to search against. Both then go and find examples that match the image and report back with their findings, including URL’s where the image is being used. 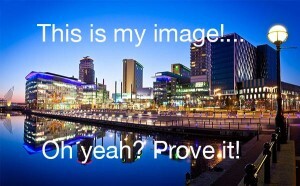 In the example image above I’ve used the Mediacity at night shot. It doesn’t have to be a very high res image for the image searches to match to. Anyway I was having a little image search and happened upon a couple of companies using my images that really should know better, so I fired off a couple of emails requesting a take down. Take a screen shot of the page/s that your work appears on. Make sure you include the full URL. Next go to http://archive.org/web/web.php and search the website URL. This is an invaluable resource and allows you to see when they placed the image onto their website (years or months ago). This provides documented evidence of how long they’ve been using the image/s for should the client say they’ve only just put that image up on their site. As well as a screenshot, I always download the image from their web page and check the EXIF data. 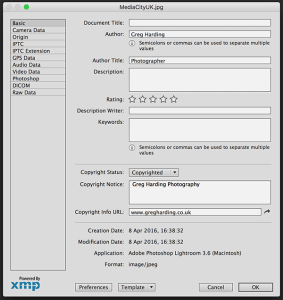 EXIF data is information such as; photographer name, copyright information, contact details, web address etc. See example below. As a professional photographer I always embed these details into the EXIF of my files and if you’re lucky and the client is lazy they’ll have left it alone and it’ll still be there when you confront them. Some websites try to save disk space and reduce file size, this can strip the EXIF data out of the file so it may be missing. Not very helpful for us photographers. All is not lost though. In this example the image searches pull up images that are the exact dimensions that are on my website 890×550 pixels. This is a dead give away that they’ve just lifted it from my site. Tut, tut. 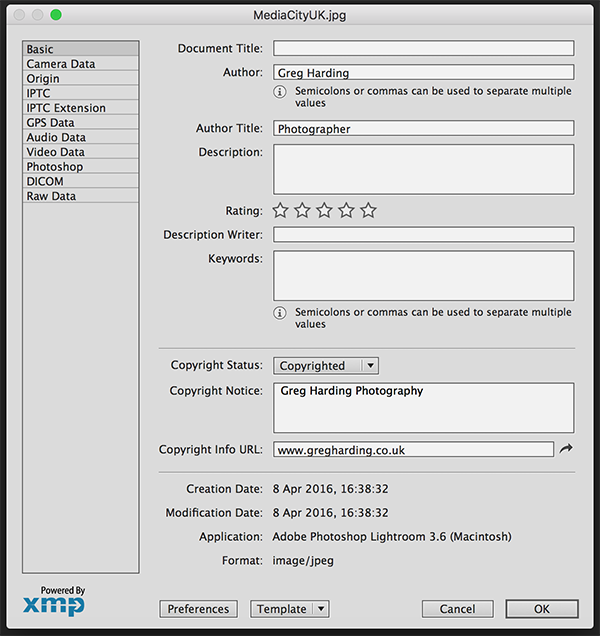 On the last couple of occasions I found the EXIF data still intact and it’s pretty simple to ask them to check the file properties for the ownership details. Most often this alone is enough for most clients and they can start to take ownership of their mistake. Anyway, once you’ve gathered your evidence, just fire across an email outlining the ‘accidental’ mis-usage, which image they’re using (paste in your screenshot) and ask them to remove and/or pay for the usage to date, if they wish to continue using it offer them a cost for this. I personally don’t go in for stinging them for the infringement although this might depend on the size of the company using the image and how prominent they’re using the image. In previous encounters with clients that I’ve thought I could work with, I’ve set up a meeting with their marketing manager to open a dialogue to future work, other clients I’ve just asked for a usage payment and a take down. If you approach it professionally, there’s a good chance of bringing them on board as clients that could use you in the future, after all they like using your images already! Stay positive and open. Going in all Rambo will definitely create walls that will be hard to break down, save that for when they flatly refuse to talk to you and/or categorically deny that they’re in the wrong. Then you can offer them a chance to talk to your legal representative. Keep in mind that in most cases the usage is ‘accidental’, as some intern or website builder has been tasked with putting an image in place and the first the manager knows about the infringement is your email, so state your claim and offer a reasonable out for the client. Often the calm (I don’t know if you’re aware, but…) approach will get a result that works for you and your new client.